How to make Banana Bread. 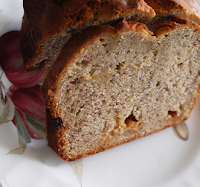 Banana breads are probably the easiest things one can bake. It's a very easy process and the results are always so comforting. Cream buter and sugar till creamy and light. Beat eggs, a little at a time. Add banana essence and mashed bananas and fold in sifted flour. Beat in milk alternately. Pour mixture into a lined and greased 9 x 5 x 3 in. (23 x 13 x 7.5cm.) tin. Bake in a preheated oven at 350°F till bread is golden in colour and a skewer comes out clean when inserted. See Customer Reviews and Compare Bakeware sets . Cool and cut neatly before serving.